The Adult Social Care Survey (ASCS) and the Personal Social Services Survey of Adult Carers in England (PSS SACE, widely referred to as the Carers’ Survey) capture data on the quality of and outcomes from social care services for all publicly-funded social care service users and (informal) carers. These data are used to populate indicators in the Adult Social Care Outcomes Framework (ASCOF), which are used by central government to monitor the quality of social care. All local authorities (LA) in England are required to run the ASCS and PSS SACE as part of the data returns to NHS Digital (formerly the Health and Social Care Information Centre, or HSCIC) and are encouraged to use the data to inform local social care-related planning and service improvements. Informal feedback from LAs, however, indicated that staff from all groups and within many organisations are not engaging with the surveys and/or are making limited local use of the data. Preliminary and anecdotal evidence suggests a number of reasons for this: (1) Some LAs report that the data are not useful because the survey does not ask the right questions; (2) Careful analysis is required to interpret the data accurately, and particularly to establish the impact of services; (3) LAs work with increasingly limited resources and a decision to invest in the surveys potentially means a cut elsewhere. The aims of the Maximising the value of survey data in adult social care (MAX) project were twofold: first, to find out more about the challenges to collecting and using ACSC and PSS SACE data faced by LA staff, and the local practices implemented to overcome them; and second, to develop resources to help LAs maximise the relevance, value and use of survey data for local planning and performance improvement (as indicated by more positive ratings of service user- and carer-reported outcomes in the longer term). It was envisaged that such resources would be provided in the form of a toolkit, consisting of practical guides and tools, and would be developed in collaboration with LA staff. Five research activities were conducted during the initial fact-finding stage of the project to:  explore the key challenges faced by LA staff in collecting and/or using the data;  identify the practices implemented by LAs to overcome challenges and/or maximise the local value and/or use of the data; and  establish the kinds of support LA staff would like the MAX project to provide. These activities were completed by 139 staff from 95 upper-tier LAs between December 2012 and December 2014, and are summarised in Table 1 below. fulfilling them using survey data and existing resources (planning and analysis stages); knowing how to navigate and analyse survey data (analysis stage); and making sense of analysis findings, such as the significance of direct-benchmarking comparisons and/or the potential reasons underlying reported outcomes (interpretation stage). Other barriers affected all stages of the survey process and included insufficient time and resources, widely-held perceptions about the purpose and local value of ASCS and PSS SACE data, and a lack of engagement among key survey stakeholders within the organisation. These local practices and barriers are discussed in the MAX working paper, further analysis case study report and a series of blogs. 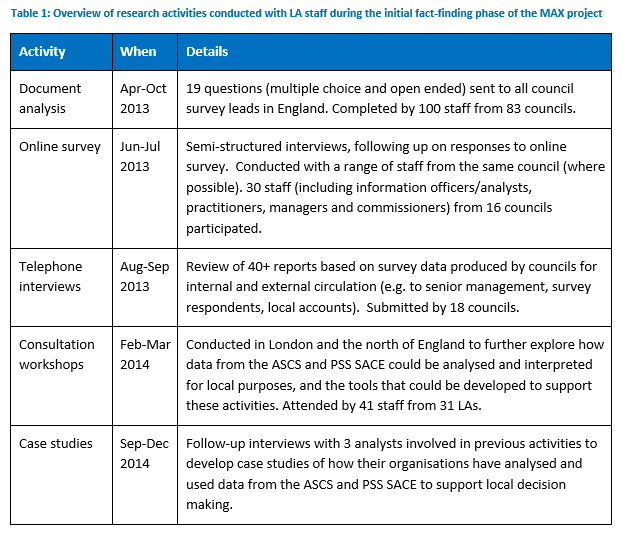 The findings of these initial fact-finding activities were used to inform the development of the MAX toolkit which aims to support LA staff to maximise the relevance, value and use of ASCS and PSS SACE data for local performance improvements (as measured by improvements in service user- and carer-reported outcomes). The MAX toolkit consists of guides and tools associated with the key stages of the survey process and (stakeholder) engagement throughout (see Figure 1 below) and is designed to supplement existing survey guidance provided by NHS Digital. A draft version of the MAX toolkit was reviewed by a group of LA collaborators between December 2015 and April 2016. The feedback provided through this consultation was used to make minor refinements to individual elements (e.g. guides and tools), and further work by the project team improved the overall accessibility and practicality of the toolkit. The MAX toolkit was launched via restricted-access pages of the project website on 30 June 2016 and is free to use. See the project website – www.maxproject.org.uk – for further information. Alongside the MAX toolkit, the project also produced a number of papers and blogs. These are summarised below, along with a journal article that is currently in planned submission. Julien Forder, Karen Jones and Clara Heath. Previous members of the MAX project team: Juliette Malley, Stacy Rand, Danielle Roche, Kamilla Razik, Jennifer Beecham, Diane Fox and James Caiels.